Please see full Monastic Visit program below. 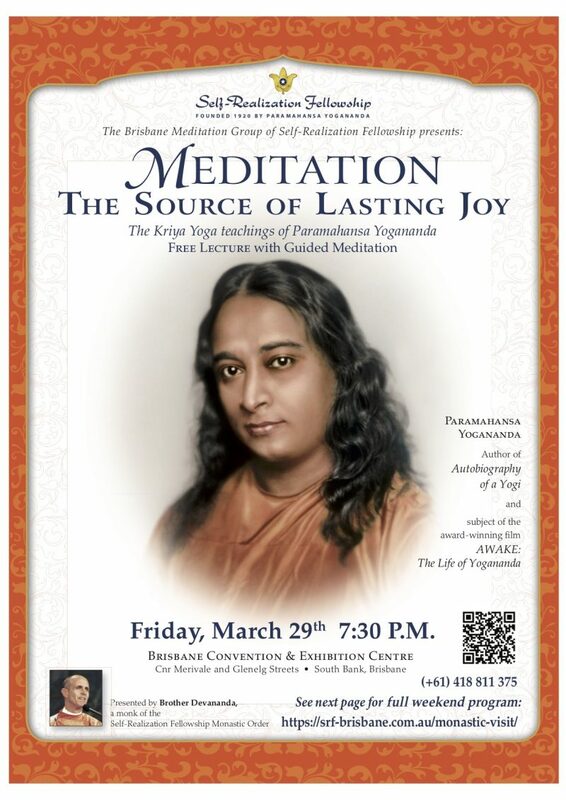 We are happy to announce that Self-Realization Fellowship monastic disciples will be visiting Brisbane, Australia, March 29 – 31, 2019, to meet with members and friends of Paramahansa Yogananda’s spiritual family. There will be inspirational programs, meditation classes, and a Kriya Yoga initiation. We welcome your participation in this spiritual weekend and hope that it will serve as an opportunity for you to share in the experience of divine fellowship, as well as to deepen your understanding and practice of our Guru’s teachings. While we recognise that some of you may not be able to attend the whole weekend, we encourage you to participate as much as you can in these special meetings. If you would like to register for the SRF Lessons prior to the monastic visit please click on this link. We ask that no audio or video recordings (cell phone cameras included) be made during the events, and that still photography be limited to outdoor areas. Thank you for your cooperation.